As a sales of Optical Transceiver Modules should know that the working temperature will influence the parameters of the optical transceiver. When the applied environment temperature of the module is changed, then the working current will change as the temperature changes. At the same time, it will lead to changes in the parameters of the optical transceiver.Thus affecting the normal transmission of the optical transceiver. Today we are talking mainly about the causes of the high or low temperature of optical modules and their effects. 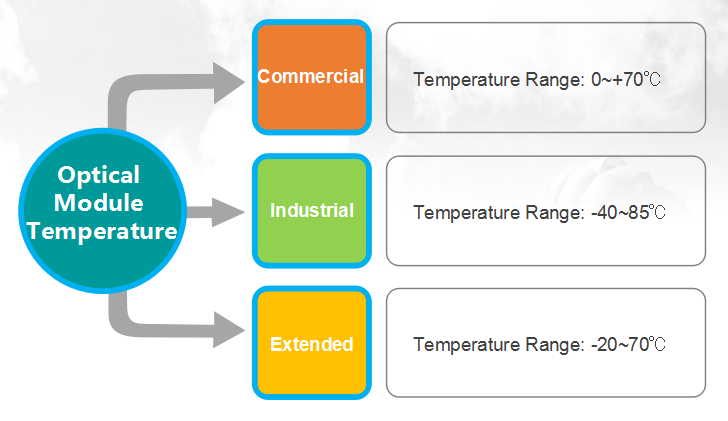 The temperature of the optical module is divided into commercial temperature, extended temperature and industrial temperature. Which factors cause the optical module temperature to be too high or too low? If the optical modules’ quality and workmanship are rough, then it is more common to produce optical module temperature anomalies. Because the performance of such optical modules is unstable, the heat dissipation is also poor. In order to reduce the temperature anomalies and unnecessary losses, it is suggested to use good performance, quality and workmanship modules. Optical modules are mainly used in data centers, computer rooms or switches. If applied in other environments, changes in the ambient temperature will change the optical module temperature, the optical power and optical sensitivity are also affected. Warm reminder: If the using environment of optical module is bad, it is recommended to choose optical module with industrial temperature or extended temperature. The temperature range of new optical module is usually 0-70 degrees, and the used optical module can not be reached. Therefore, in the environment of too high or too low temperature, the used optical module can not work properly. It is recommended that you use the new optical module. If the temperature of the optical module is too high or too low, the function of the optical module will be affected and the communication data will be wrong. So what is the effect of high or too low temperature to the optical module? If the working temperature of the optical module is too high, the optical power will become larger, there will be an error in the received signal, or even burn out the optical module, which will cause the optical module to not work properly. If the working temperature of the optical module is too low, it will cause the optical module to be unstable. If the using temperature is too low, industrial optical module is recommended.